Updated for 2107 this post was first published in 2009, about the same time as most of the other commercial loan workout articles were published out there on the web. I’m republishing today because I believe strongly that commercial property is broadly overvalued, lending has been loose and lenders will be, once again, scrambling to do workouts on ill conceived commercial loans in the not-too-distant future. If you’re in the distressed assets end of the business I hope this article serve as a primer for commercial workouts for you. 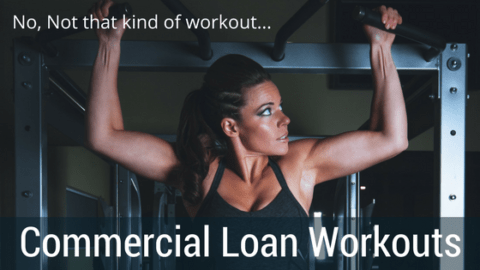 What’s a Commercial Loan Workout Anyway? When a lender is working with a borrower to get a problem commercial loan resolved the loan typically goes to “workout”. When a commercial loan is criticized internally, when it’s out of covenant, or when the borrower fails to pay or pays late the loan will often go the the workout department of a bank unless the bank uses a special servicer or, at really small banks, the workout is handled by the commercial loan officer on the line. In this article we’ll take a look at how these distressed commercial property loans get worked. What Makes a Commercial Property Distressed? 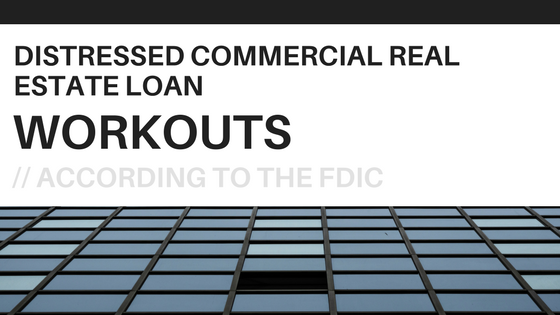 Before we talk about a workout let’s talk about how commercial loans become distressed and find themselves in the workout department of a bank because it’s not as straightforward as a residential or consumer loan. Commercial loans can end up in the workout department if they are in monetary default or in technical default. A commercial loan can be considered to be non-performing whether it’s in monetary or technical default. A monetary default occurs when the borrower is late on or does not make payments. A technical default occurs when the borrower violates other terms or covenants within the commercial note. The owner fails to maintain the property as prescribed. The list goes on. And since commercial loans are between two businesses the borrower is expected to be more savvy and be more equipped than, say, a consumer. Therefore the terms and covenants in commercial loans are not regulated to the same degree as residential property loans and that means that the borrower should pay close attention to the covenants and be prepared to meet them lest she be caught blindsided by the workout department. I’ve worked with private equity lenders, maybe you’d call them hedge funds, as well as banks in commercial loan workout scenarios. And I’ve even seen private lenders roll up their sleeves and work with the borrower to help them get reperforming. Private lenders can do just about anything that’s legal and the borrower agrees to in their workouts. Banks and credit unions cannot, they’re regulated and those regulations dictate their workout options. NOTE: It’s probably important to distinguish between whole and portfolio loans and CMBS. CMBS (Commercial Mortgage Backed Securities) workouts, because they are sold as securities and governed by the REMIC structure are always handled by a special servicer. I don’t have any personal experience in the foreclosure or workout of CMBS assets and I’m not writing about that. A commercial workout officer’s job is to collect what the bank is owed, in full, and make the bank “whole” on the loan. A good commercial workout officer (and I’ve had the pleasure of working with a number) knows about his assets, his borrowers, the local market and his vendors and uses all of those resources to collect. Depending on the size of the bank and the size of the loan a commercial workout officer may be very hands on or may direct the recovery and workout from behind a desk across the country. I’ve sold assets for both types. I think I prefer the former. Because banks are regulated the rules and guidance around workouts varies significantly from those of private lenders. It is intended to promote supervisory consistency, enhance the transparency of CRE workout transactions, and ensure that supervisory policies and actions do not inadvertently curtail the availability of credit to sound borrowers. But it goes on to talk about accounting principles in dealing with distressed commercial real estate loans in determining their reporting status – accural vs a non-accrual loan. If you’re working with banks’ distressed commercial real estate loans then it is fair to say this is a must read. This document should give you insight into what bank’s need to take into consideration knowing that reporting is tightening up. I’m going to try to hit the highlights for you in this post since this is a government produced document and I don’t want my readers falling asleep. Loan workout arrangements need to be designed to help ensure that the institution maximizes its recovery potential. Further, renewed or restructured loans to borrowers who have the ability to repay their debts under reasonable modified terms will not be subject to adverse classification solely because the value of the underlying collateral has declined to an amount that is less than the loan balance. So in short, if the borrower and guarantors of a distressed commercial real estate loan can write the check and you’d rather extend the loan, restructure the loan or what-have-you, the fact that the property is worth less than is owed is not the determining factor for whether or not the bank has to action on a CRE loan in technical default (default for reasons other than non-payment). It also say that bank’s must do whatever will allow them to maximize capital recovery (essentially). Basically look at the whole borrower and the guarantors. If they have the ability to continue to pay and their future ability to pay is defensible then carry on. A good guarantor with a solid contract means you can keep reporting the loan is in good standing. A new appraisal may not be necessary in instances where an internal evaluation by the institution appropriately updates the original appraisal assumptions to reflect current market conditions and provides an estimate of the collateral’s fair value for impairment analysis. I think this is important because it seems like it’s realistic appraisals that determine liquidation potential. If you’re in the transaction business this is important for obvious reasons. The documentation on the collateral’s market value should demonstrate a full understanding of the property’s current “as is” condition (considering the property’s highest and best use) and other relevant risk factors affecting value. If you were thinking you were making condos but there is no condo market so now you have apartments you’ve got to say it. This is a big one because with some $90+ billion in bad construction debt out there there are a lot of projects that are not going to take the shape that was originally envisioned for them. Huh? Are projected stabilized values anything like reality today? If you’re a borrower this is great if you’re a bank you’re probably just delaying your troubles. This looks like a big get-out-of-jail-free card for a well funded borrower. I think it shows that if you can put together a real plan that looks good on paper you can buy yourself a lot of time. Examiners generally are not expected to challenge the underlying valuation assumptions, including discount rates and capitalization rates, used in appraisals or evaluations when these assumptions differ only in a limited way from norms that would generally be associated with the collateral under review. Make it believable and the borrower gets a pass. Many borrowers whose loans mature in the midst of an economic crisis have difficulty obtaining short-term financing or adequate sources of long-term credit due to deterioration in collateral values despite their current ability to service the debt. In such cases, institutions may determine that the most appropriate and prudent course is to restructure or renew loans to existing borrowers who have demonstrated an ability to pay their debts, but who may not be in a position, at the time of the loan’s maturity, to obtain long-term financing. The regulators recognize that prudent loan workout agreements or restructurings are generally in the best interest of both the institution and the borrower. READ: as long as we’re in this credit crunch if your CRE loans are due and a refi is not possible for whatever reason, as long as the borrower can pay, you work out how you see fit, we understand and we’ll be patient. The next few sections don’t provide us much insight as distressed asset deal makers but I think it is informative to see how the FDIC would like the banks to be thinking. This section speak specifically to how to classify the loss or potential for loss with a CRE loan. Specifically it indicates that when the sale of CRE is necessary to repay a loan the amount that that property is under water should be classified as “doubtful” but use that term sparingly. When you restructure a loan and charge off a piece the remainder of the loan is at worst substandard (rather than ‘doubtful’). It goes on to say that one workout strategy might be to separate the loan into two enforceable loans, and then you put the senior piece on your books as ‘accrual’ in many cases (meaning ‘its all good’). If you restructure a loan that is not already in nonaccrual keep it out of there but document everything. If the restructuring happens after it hits nonaccrual then you’re going to need 6 months more of good history before you move it back to accrual. I think the lesson here is that if you’re a borrower with a distressed commercial real estate loan then you should be working hard to modify or restructure your loan BEFORE you get into trouble. A sustained period of repayment performance generally would be a minimum of six months and would involve payments of cash or cash equivalents. If anyone can tell me what the cash equivalent is I’d love to hear about it in the comments. Do interest reserves count? The paper goes on with about 14 pages of commercial loan workout examples and several pages of attachments. Anyone working to restructure CRE loans for borrowers or those working with banks should read these. This was the first of the distressedpro.com professional podcast series. The goal of this series is to bring real life, real time, information to our members and subscribers about how professionals on the front-lines of the distressed property and loan market are making it all happen. In this episode I talk with Bob Thomas. Bob is the owner of Turnstone Property, a Boston based firm that offers debt and asset management services for individual assets and portfolios, including loan portfolios and REO. Bob’s website goes on to say that Turnstone principals have extensive experience identifying, planning, underwriting, and executing complex projects. Particular expertise in repositioning and disposition of under-performing and nonperforming assets, adaptive re-use and urban infill. Learn from other real estate professionals on the front lines and learn more about how you can be successful with investing in distressed assets or servicing those lenders who need your help in this shifting market. This pretend and extend policy is setting the stage for the next bank bailout.